I have been an Independent York Councillor since May 2015. Along with thousands of others, I believe the planning permission process for Clifford's Tower visitor centre was seriously flawed. Thank you to all who have donated on Crowd Justice. We are about to close our Crowd Justice account on Monday 20th August as our legal case has come to an end. Clifford's Tower in York is recognised around the world as one of Yorkshire's truly iconic landmarks. It is an enormously important monument, steeped in 750 years of history. But on 27th October 2016 the City of York Council planning committee gave approval for the English Heritage visitor centre plans, including a concrete and glass building incorporating a souvenir shop, coffee bar and viewing area, which will be embedded in the base of the mound itself. Thousands of York residents, and people from around Britain and the world object to these plans and believe that this is a huge mistake. It is felt that it would be an offensively commercial addition to this much loved landmark. Proposed visitor centre, souvenir shop and coffee bar. A petition with 3778 signatures has been officially presented to City of York Council. It was also handed in to the English Heritage HQ in London by York Central MP Rachael Maskell. We strongly believe that the planning process which gave this permission was seriously flawed and should be reviewed. We believe it deserves a better plan than this ill conceived addition. I have therefore applied to the High Court for a Judicial Review and the process has commenced. My wife and I have paid £7,354 of our own money towards the costs already. So we are crowdfunding for those legal fees and possible further fees to have this planning decision reconsidered. If this judicial review is successful, the aim will be to persuade English Heritage and City of York Council to consider alternative sites away from the mound. This could be incorporated into the imminent strategic plan for the area, known as the "Southern Gateway". 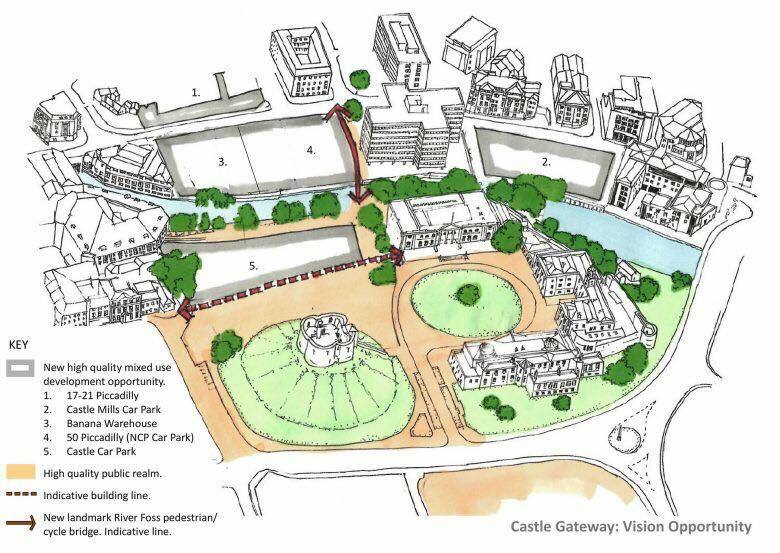 This could potentially include the remodeling of the ugly Castle Car Park which sits directly next to Clifford's Tower, a scheme that English Heritage themselves would strongly favour. The crowd funding would be as follows:- Stage 1 is the "Permission Stage" where a Judge considers the papers and decides whether it should go forward. The total fees for this are approx £7800 including CrowdJustice fees. If we hit this target, it is feasible that the case could be quashed at this point. If the defendants do not quash the case will move on to the next stage. Stage 2 is where papers are prepared for the High Court hearings. This will entail fees of a further £7800. Again if we hit this second target the defendants may decide to quash at this stage. If they decide not to quash then the case will go to stage 3. Stage 3 will be a full High Court hearing and the legal fees are estimated at a further £35,000 approx. including defendants cost. We are very optimistic that this Judicial Review will be successful. If we are successful then this will allow York the opportunity to give this beautiful monument and area a more fitting plan for the future. Your contribution could help safeguard a much loved monument as it stands and provide a more optimistic plan for the future. 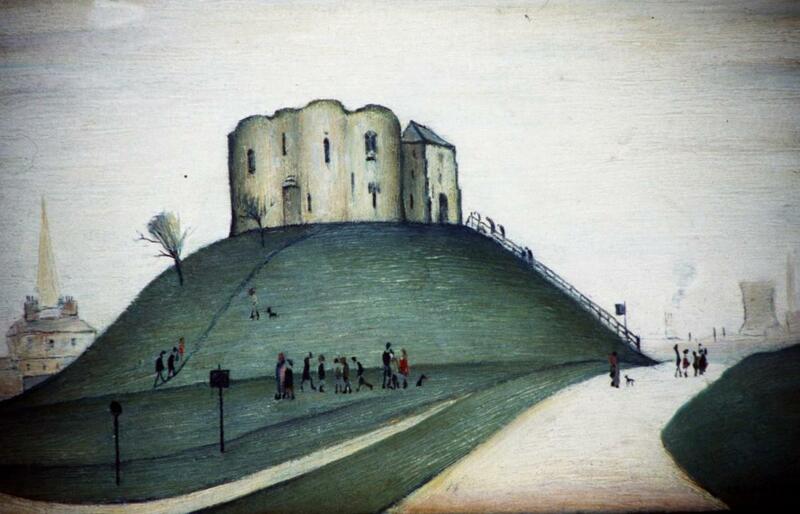 Oil painting by LS Lowry 1952. Original at York Art Gallery. In June 2018 English Heritage decided not to go ahead with this proposed building at Clifford's Tower. So in early July 2018 we withdrew our Appeal against the verdict of the Judicial Review. We therefore need to close our Crowd Justice web site. We are now setting up a gofundme.com crowd funding site to raise some of the remaining £27,500 that my wife Frankie and I have spent from our personal savings to pay for legal costs of the Judicial Review in May 2017. We do not anticipate raising all of this amount. We would be very grateful to reduce this amount with any further donations from people who have supported the Not in the Motte Campaign or are just relieved that the Visitor Centre building will not be built in the motte. I would like to thank everyone who has donated so generously to our legal case and to thank Crowd Justice for all their support and advice over the last 20 months. Update on the crowdfunding target. Following receipt of the final accounts from Shulman’s Lawyers we are pleased to say that we can now reduce the target down to £55k rather than £60k. There were £5k costs outstanding for the court hearing in Leeds although it was on hold pending the Appeal hearing. These outstanding costs have now been waived as we withdrew our appeal. We would like to clarify that we are now raising funds in order to re-coup legal fees already spent by Johnny and Frankie Hayes. The first £15k of Crowd Justice was already used directly by the lawyers and court, leaving £40k paid up-front by Johnny and Frankie Hayes. In the last few weeks a further £10,000 has been pledge by you. We are incredibly grateful for the support from the York community and beyond. Appeal application withdrawn as Visitor Centre will not be built. I wanted to first of all thank English Heritage for their decision not to go ahead with the visitor centre. I think they are now looking optimistically to a better alternative within the Castle Gateway prospective plans. I am also pleased that City of York Council on 12thJuly Executive Meeting decided to reverse their previous decision to sell the land at the base of the motte to English Heritage. These two steps combined means that we now have certainty that visitor centre will not be built as planned. Today I signed the papers to withdraw our appeal to the Court. This is due to the fact that English Heritage had taken their decision to not go ahead with the Clifford’s Tower visitor centre. So the substantive part of our case “the building of the visitor centre” has already been determined. To go to court my lawyers have explained to simply determine an “academic “judgement would not have been welcomed by the court. This therefore means that we were unable to claim any costs had we won the appeal. We have therefore extended our target to cover all the costs that have been paid for the Judicial Review. This is £60,000. I would like to thank our legal team with Amanda Beresford at Shulmans in Leeds and QC Anthony Crean and Killian Garvey from King Chambers Birmingham for all they have done for our case. The work they have done for the appeal has been on a pro bono basis and we are eternally grateful to them. We would not have achieved this huge turn around without their help and expertise. Can I thank everyone for their donations to the Campaign to Save Clifford’s Tower. We hope that we may be able to fund raise for some of the approximate £40,500 that Frankie and I have spent from our personal savings. The 7th June 2018 was a momentous day for the Save Clifford's Tower Campaign. English Heritage decided not to go ahead with the Visitor Centre development. Their decision was taken I understand on the basis that they now recognise that the visitor centre was so very unpopular and there were now better alternatives with the emerging Castle Gateway project that will revamp the whole area around Clifford's Tower. They now aim to provide facilities perhaps in conjunction with the Castle Museum to provide a first rate visitor centre for the whole site. Despite this wonderful news the Appeal Court Case is still due to go ahead on the 23rd July. This will decide whether the judgement that Justice Kerr gave on 7th June 2017 about the original planning permission was flawed. That judgement has set a worrying precedent. If this judgement is allowed to stand then similar decisions to the Clifford's Tower Visitor centre might be repeated again and again. The Judgement gives developers the ability to risk harming archaeology simply by recording the evidence of our passed. Archhaeology needs protection under planning law and this judgement put at risk by that protection it presently has under NPPF 141. Enclosed is a Guardian Article on the English Heritage change of mind. Revoke the Scheduled Monument Consent. The Save Clifford's Tower Campaign has written to the Secretary of state to ask for the Scheduled Monument Consent to be revoked. This follows the information from English Heritage after an FOI was sent in January. This revealed the extent of the underground wing alongside the proposed Clifford's Tower visitor centre. Historic England are refusing to send one document which is is an impact assessment on the scale of the excavation. The Information Commission is looking into this matter. Please contact English Heritage and give them your thoughts on the matter. I have enclosed a link to a Guardian article from 27th April 2018. Thank you for all the support we have received. We have been informed that the trial date has been delayed until the 23rd July 2018. This is due to the legal teams not all being available for the date in May that was recently set by the court. It is a bit of a disappointment but we are still very hopeful that our appeal will be successful. We have heard that the Appeal Court date for the trial at the Royal Courts of Justice in London will now be in May. It has been postponed because there were no Judges available for the 11th or 12th April that was previously set for the trial. We have no set date as yet but we have been told the Rt Hon Lord Justice Lindblom will be presiding. Our legal team feel that we have a very strong case at appeal. As mentioned previously the focus will be on NPPF 141 which is about the harm done to archaeology. We have asked to receive a lot of documents from an FOI request to English Heritage and it seems plain to us that the harm to archaeology will be considerable in the event of the Visitir Centre being built. We cannot yet reveal the details until we have finally received all the documents requested. We are going to relaunch our fund raising efforts for the Appeal. We may need to raise a possible £5,000 for City of York Council's legal costs if we were to lose the case. This is in addition to our own legal costs. Our legal team have offered to do the work pro bono. However we would like to raise money to contribute towards our legal teams costs. We have set a total target to raise a further £13,600 which would include court costs, third party costs and our legal teams expenses. To date we have spent approximately £60,000. Could I ask supporters to go to the "York Local Plan Making comments to government" before the deadline of midnight on 4th April to express your concerns about the fact the Local Plan has already appropriated the piece of land where the Visitor Centre is due to be built. It was designated as Open Space and the Council by law are not allowed to appropriate such land without following due process and advertising that they are disposing of this land. "Local Government Act 1972 Section 123 (2A)." This should not be done until after the appeal and after the period of advertising to allow people to object. Our Appeal will be held on 11th or 12th April 2018. It will be held in front of 3 Appeal Judges and we assume this will be at the Royal Courts of Justice in London. Our Appeal is based on one aspect of the verdict of Justice Kerr following the Judicial Review back in May 2017. That aspect is the harm done to archaeology. In particular the case will focus on one paragraph from the National Planning Policy Framework (NPPF). The paragraph has not been ruled on previously. It is NPPF 141. 141. Local planning authorities should make information about the significance of the historic environment gathered as part of plan-making or development management publicly accessible. They should also require developers to record and advance understanding of the significance of any heritage assets to be lost (wholly or in part) in a manner proportionate to their importance and the impact, and to make this evidence (and any archive generated) publicly accessible2. However, the ability to record evidence of our past should not be a factor in deciding whether such loss should be permitted. This might seem a very technical paragraph. However it is a fundamental point that safeguards archaeology from being disturbed or destroyed by developers. Developers who might argue that carrying out research and recording that research could be beneficial. Any research or display of finds cannot be used as a material benefit to allow the loss of archaeology. The construction of the Clifford's Tower Visitor Centre will harm archaeology and this precious scheduled Monument. We are trying to stop this from happening. Minster for Culture to write to EH to ask for rethink on Clifford's Tower. The Minister for Sport and Culture John Glen is going to write to English Heritage to ask them to think again about where a visitor centre might be built. The Minister had a meeting with Rachael Maskell MP for York Central last week to discuss Clifford's Tower. The focus of their meeting was the new opportunities that have come from the recently published City of York Council's Castle Gateway Report. A major aspect of the report suggests that the Castle Car Park should be redeveloped and that this could be a much better site for any potential visitor centre for Clifford's Tower in the future. (Link below gives details.) We are delighted with this news. We have also heard that our Appeal will definitely go ahead and that it will be heard at the Royal Courts of Justice in front of 3 appeal judges. There is no fixed date set as yet for the hearing however we have been told that it will be heard before 31st October 2018. We are feeling confident that we will win the Appeal. In May 2017 the Clifford's Tower Visitor Centre Judicial Review was heard at Leeds Crown Court. We hoped that the Judge would rule that the planning permission for the highly contentious English Heritage visitor centre would be ruled unlawful. However we lost the case but we remained convinced that our case was worth fighting for. So we applied for leave to appeal against that verdict. On 3rd October 2017 an Appeal Judge the Right Honourable Lord Justice Hickinbottom having considered the application and accompanying documents has given permission for an appeal to be heard. A date is yet to be confirmed for the hearing. The Judge gave his reasons for giving permission were "I am persuaded that the grounds are arguable." He also said "This appears to be the first case in which the meaning and effect of paragraph 141 of the National Planning Policy Framework have been considered." In other words this will be a test case for recently established planning law with regards development and its impact on archaeology. The whole case will focus on one aspect of planning law about development and its impact on archaeology. The Court of Appeal will be looking at the detail of the Planning Laws governing how heritage assets should be treated and whether the verdict of the Judge in May was flawed. We are very hopeful that we will win this appeal and that the planning permission given for the Clifford's Tower Visitors Centre on 27th October 2016 will be quashed by City of York Council. The Judicial Review to date has cost a ourselves a total of £51,350 and we have raised through the Crowd Justice site a total of £15654 to date. The bulk of those costs have come from our own personal savings. We set that target back in March 2017 to raise £15,600 from the public, which we reached in June. However the potential cost of the Appeal could also be significant as well. So we propose doubling our target to raise a grand total of £31,200 from the public through the Crowd Justice site. Please help us to reach this target. Clifford's Tower is a wonderful Heritage Monument. The proposed development in the motte is the wrong building in the wrong place.There are much better alternatives for a visitor centre in the newly proposed revamp of the Castle Car Park adjoining the motte. Our aim if we win is to persuade English Heritage to build the right building in the right place. We are about to send in our application on 20th June to the Royal Courts of Justice in London. 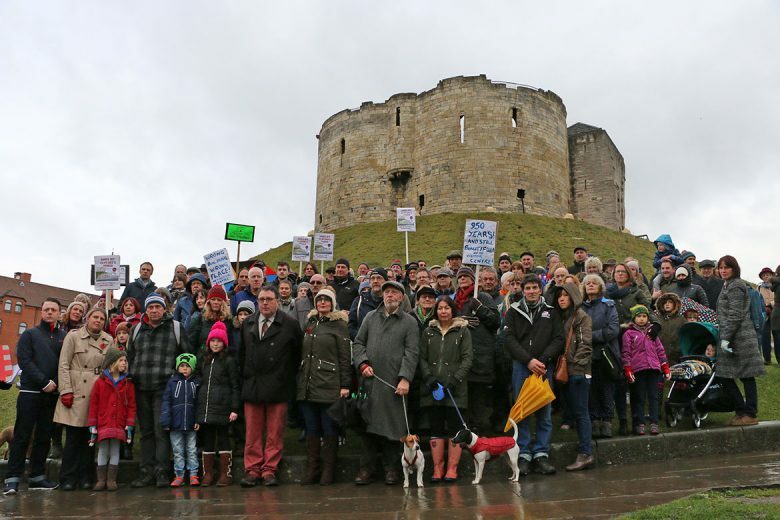 We are asking for the right to appeal against the Clifford's Tower Judicial Review Verdict. We feel that it is very important that we should win this appeal. Not only to protect Clifford's Tower from this development, but to help safeguard Heritage Monuments, Listed Buildings and Conservation Areas in the future. This verdict if not overturned in the appeal courts will become case law. It will in my view make significant changes to planning law and to the protection that archaeology and heritage monuments presently enjoy. It will shift the balance in favour of the developer. This is a watershed case that will effect our heritage around the country. We are convinced that there are much better alternatives to the visitor centre in the motte that has such an impact on Clifford's Tower. The newly proposed Castle Car Park redevelopment scheme offers a hugely exciting alternative. Please help persuade English Heritage to reconsider. Write to the Trustees and to the English Heritage website. Please share this site with friends and family. We need to raise more money to face the appeal. The Save Clifford’s Tower campaign received the High Court judgement today. 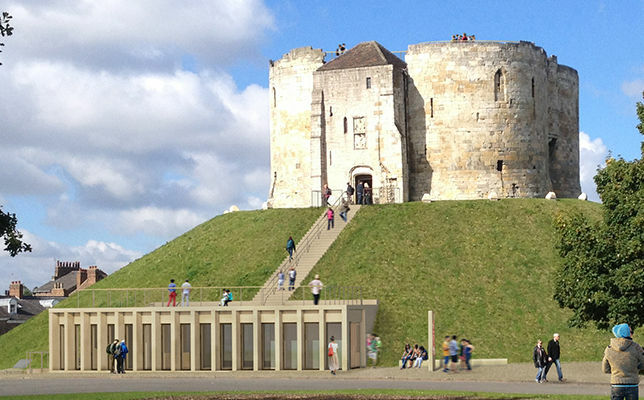 We have been unsuccessful with our Judicial Review into the Clifford’s Tower Visitor Centre. We will continue to fight the Visitor Centre proposal. It was announced at the royal Courts of Justice that we had failed in our Judicial Review. The Judge, Mr Justice Kerr said that this would be a significant judgement and he has taken several weeks to determine his verdict. This verdict is a huge blow and we are very disappointed, but we now need to consider what our next steps should be. Despite this disappointing news we are not giving up our fight against this development. We are listening carefully to our legal team’s advice about where we go from here. It has been a very long few months waiting for the outcome of this Judicial Review. It has had a very high personal and financial cost. Many people have supported this campaign and we are very grateful for that support. If the Clifford’s Tower Visitor Centre is built it in the motte it will become a little loved building by the few and a much hated building by the many. In our view it is simply the wrong building in the wrong place. So we will continue our fight to try to get the right building in the right place. Approximately £14,500 or 25% of the total legal costs has been raised through donations to a Crowd Justice site. We are very grateful to everyone who has contributed. The remaining legal costs have come from the Hayes family personal savings. We will continue fund raising. Still waiting for the verdict. We are still waiting for the Judges verdict. The court case was on 3rd May so Mr Justice Kerr is clearly taking his time to make his decision. We are still hopeful that we will be successful. However nothing is guaranteed. The case has cost up until now approximately £50,000. Our fund raising target of £15,600 was to get us to beyond permission stage and to the hearing. The costs for this hearing have been paid in advance by Frankie and I. We hope to recoup these costs if we are successful. Once the verdict is in and assuming we are successful then we will need to do our utmost by writing to the planning website and to councillors to register that the "visitor centre" should be rejected. Even if we are successful with the judicial review we will need to do all we can to ensure that a resubmitted application does not sail through planning again. Can I thank everyone for their generous donations. Judgment reserved for later date. Judicial Review at Leeds Crown Court 3rd May. The Clifford's Tower Judicial Review will take place on Wednesday the 3rd May at Leeds Crown Court. Our case is being prepared by our legal team and we are optimistic about our chances of success. It is anticipated that this will be a one day trial. The legal costs are estimated at around £50,000, which Frankie and I have already paid out. This includes the £13,400 that we have presently raised from Crowd Funding. We would like to say a huge thank you to everyone who has contributed to the Crowd Justice website. If we win the case then we can expect to receive costs from City of York Council of up to a maximum of £35,000. If we lose then we will have to pay a further approximately £5,000 maximum. This is because I have taken out this case as an individual and the Judge at permission stage ruled that I would qualify for what is known as an "Arhaus" exemption. This limits the amount of costs that individuals have to pay in costs in environmental cases to large organisations like CoYC. We feel that our case is a strong one. That this planning permission should not have been granted. However even if we win the case we will need to look to the future and be prepared to stop a very similar application being resubmitted by English Heritage. The Castle Gateway report and the remodelling of the Castle Car Park we feel is the best way forward for all concerned. Can I thank everyone again who has contributed to the Crowd Justice website. Could I ask that you share this with your friends and family to help fund the still outstanding potential costs of the case. Judicial Review at Leeds Crown Court 3rd May. 15 days to go. The Judicial Review will take place on Wednesday the 3rd May at Leeds Crown Court. Our case is being prepared by our legal team and we are optimistic about our chances of success. It is anticipated that this will be a one day case. The legal costs are estimated at around £50,000, which Frankie and I have already paid out. This includes the £13,400 that we have presently raised from Crowd Funding. We would like to say a huge thank you to everyone who has contributed. This Thursday at Full Council in the Guildhall Cllr David Carr (Leader of the City Council ) will announce that work will commence on the remodelling of the Castle Car Park later this year. That the work will take around 4 years to complete. I am writing to suggest that you might write to Councillors before Thursday to suggest that the remodelled car park would be a much better location for a Clifford's Tower Visitor Centre. That English Heritage might want to take this opportunity to rethink their plans of building the controversial visitor centre in the motte and look at this newly announced and exciting alternative. (NB No.5 although it says 'car park' it is planned to be buildings)It might also be helpful if someone were to perhaps speak in advance of the meeting. If you were willing to do that you would need to contact Jill Pickering in CoYC Democratic Services on 01904 552061 before Wednesday afternoon. I have enclosed a link to the Report to Full Council. The Castle Gateway is on Page 75 onward. I think that letters arriving in the next few days could be very helpful to persuade Councillors to think about alternatives. Public Meeting Eye of York. Looking to the Future. I wanted to get in touch with everyone who has supported the Judicial Review fundraising. Our QC Anthony Crean is optimistic about our case being successful. But this is not just about the Judicial Review we need to move this debate about Clifford&apos;s Tower forward. 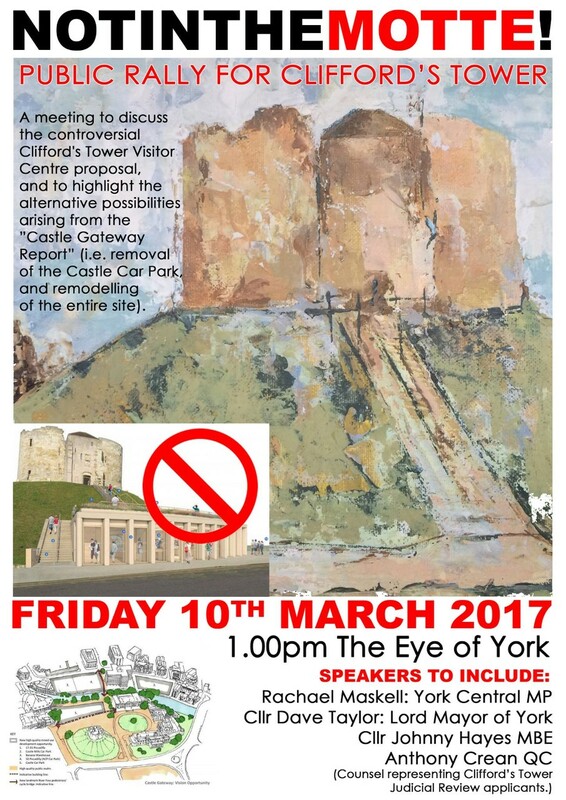 We have therefore decided to hold a public meeting at 1pm on Friday 10th March on the Eye of York to look to the future.. 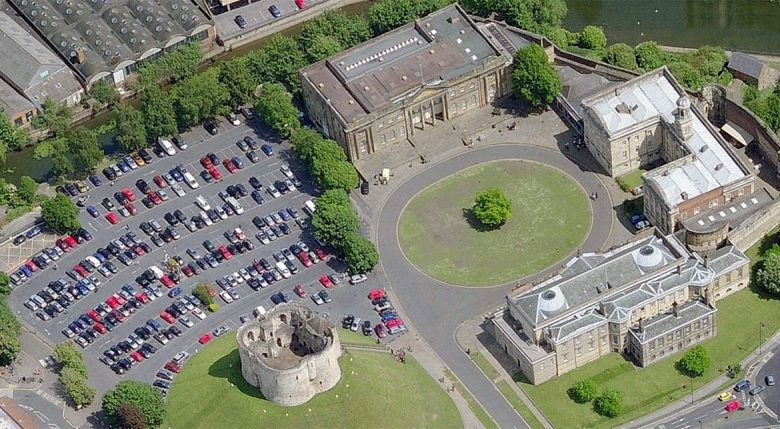 The meeting will hear from several speakers who will be looking beyond the Judicial Review on 3rd May and considering the future for the Castle Car Park and this important part of York. There will be speeches from The Lord Mayor of York Cllr Dave Taylor, York Central MP Rachael Maskell, Mr Richard Green former curator of York Art Gallery, QC Anthony Crean and Cllr Johnny Hayes MBE will all speak about the future for Clifford&apos;s Tower and this area. We are hopeful that we might win the Judicial Review but we need to have a vision of what happens next. The public meeting will commence that debate and will be followed by a more formal meeting in late March. This will help to maintain the momentum. Please come to the Eye of York on Friday 10th March at 1 pm. I went to meet Anthony Crean who is one of the country&apos;s leading planning QC &apos;s on Friday and had a "conference" with him to prepare our case to go to the high court. (The trial is due at Leeds Crown Court on 3rd May.) He is confident that our Clifford&apos;s Tower Judicial review will succeed. The High Court Judge at "permission stage" said that the Clifford&apos;s Tower Judicial Review "must be heard by a senior Judge." This is due to the fact that the case is of regional and national significance. 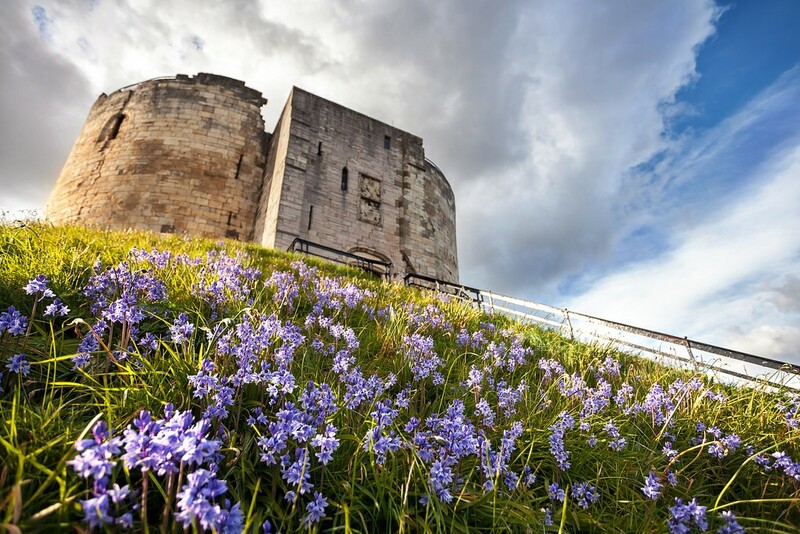 It is important not only because of the status of Clifford&apos;s Tower as one of the country&apos;s most significant scheduled monuments but also because the case itself is of important legal significance. However this is not only about winning or loosing the case it is about getting the best plan for the future for the Castle Gateway area of York. I hope that the debate around this case will start to focus on creating a wonderful space on the Castle Car Park area. The Castle Gateway is a major opportunity for York, that would provide a fabulous alternative to the present Visitor Centre proposals. It will also provide a wonderful new and exciting space for the City. We heard from our lawyer last week that the judge has granted us permission to take our case on to the next stage. We are obviously delighted that the green light has been given for the case to move to High Court. The trial will probably be at Leeds Crown Court first week of May. We have been working hard to publicise our Crowd Justice page and now need as many people to share it on their Facebook and Twitter and personal Emails. Please keep sharing as all the small donations really do add up! We have now passed our first target of £7800 which takes us up to “permission stage” for our Judicial Review application. A judge reviews all the papers and decides if the case should proceed. Thank you to everyone who has pledged so far. We are now moving towards our “stretch target “of £15600. This money will provide for legal fees to prepare papers for the high court hearing. Sometime in mid-late January we should hear whether or not the judge grants permission for the case to proceed to a high court hearing. If permission is granted by the judge, we hope that City of York Council might decide to quash the case and then move to reconsider the planning application again. We cannot guarantee this so need to be prepared to go all the way to the high court hearing. So we are now fundraising for that stage. Can I remind you that pledges are not cashed until the stretch target is reached. There is a Facebook page which you can &apos;like&apos;, follow and share as well as Twitter. Please pass information on to friends and relatives. Thank you for the support and pledges. We are now over half way towards our first target! Thank you to everyone who has pledged so far. Despite the Christmas period, we have had a lot of publicity, and more to come next week on Look North. In mid-late January we will hear whether or not the judge grants permission for the case to proceed to stage two. Stage two will then entail a further £7800 of fundraising. Please keep sharing with friends and family. There is a Facebook page which you can &apos;like&apos;, follow and share as well as Twitter.